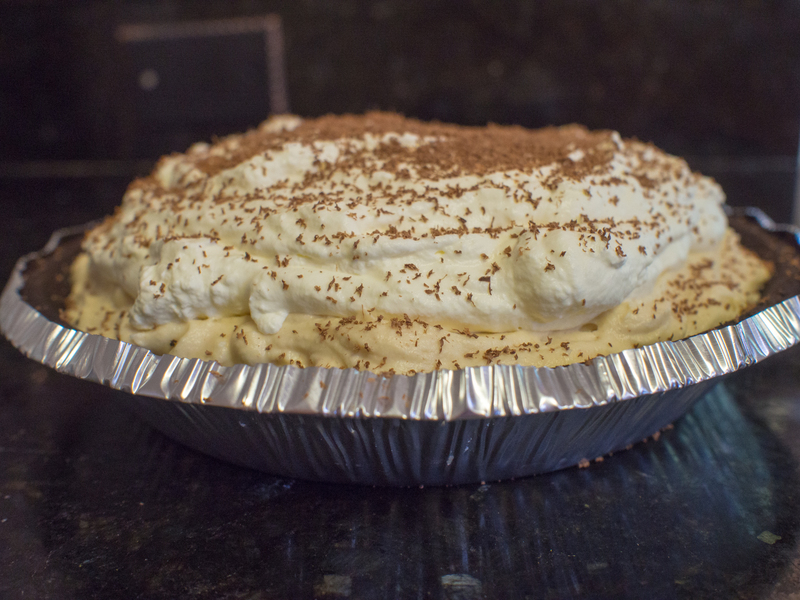 I’ve done a Peanut Butter Cream Pie in a previous blog post. You can see it here. Why do it again? One: it’s Peanut Butter Cream Pie. The question is why not do it again. The previous pie was a dense, sinful confection. This version is whisper light and airy, but don’t be fooled. This pie contains a whopping 4 cups of whipping cream. You read that correctly. 2 cups in the pie, 2 cups on top. YUM! Add to that 8 ounces of cream cheese and some peanut butter and you have a calorie extravaganza. On the plus side, making this pie is incredibly easy. It’s seriously no bake, and it doesn’t have to sit in the fridge for hours. The pie is perfect for a pot luck, or a thrown together dessert just because. The recipe is very novice cook friendly, and definitely within the abilities of younger budding chefs, provided they can use a mixer safely. I had this pie at one of Emeril Legasse’s restaurants in New Orleans. Before he became a mega start and the BAM! guy, I actually met him. Granted, he was on Food Network, when they actually cooked on that network. But, not many cable companies had the channel (mine didn’t!). He very nicely came out to my table to autograph a cookbook my father and I bought for my mother. The food was spectacular that night, but meeting and conversing with him was tremendous. Despite the passage of time, the memories of the pie stuck with me. Light, airy, yet rich and creamy all at the same time. Truly the perfect ending to a summer cookout. When I was recently invited to a cookout, I brought this pie. I made just a few changes to this recipe in the margins, but there’s no denying my inspiration was Emeril’s pie. For the original recipe, click here. Some general notes, though. I love natural peanut butter because mostly I hate transfat. 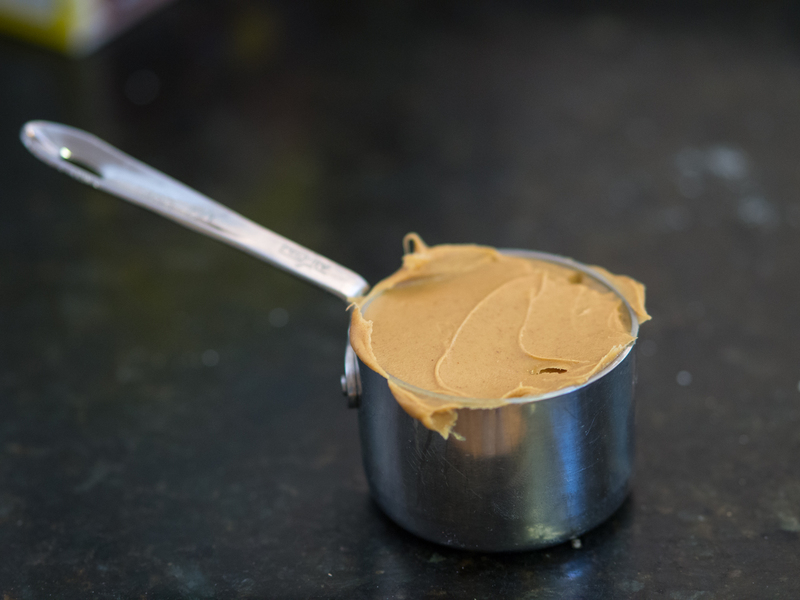 However, you need the “no stir” natural peanut butter for this recipe to really work. Also, I always use Philadelphia brand Cream Cheese. 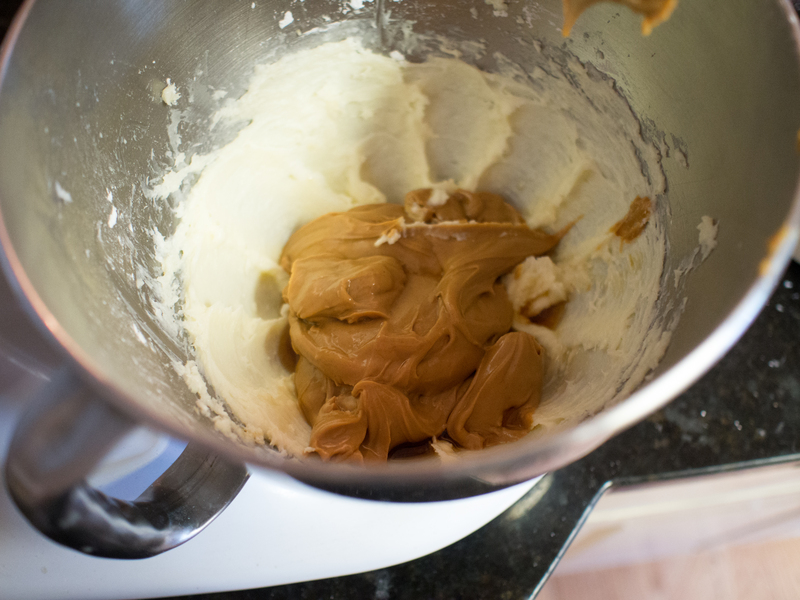 In a mixing bowl, combine the cream cheese, sugar and peanut butter. Mix until light and creamy. Add the heavy cream and mix well. 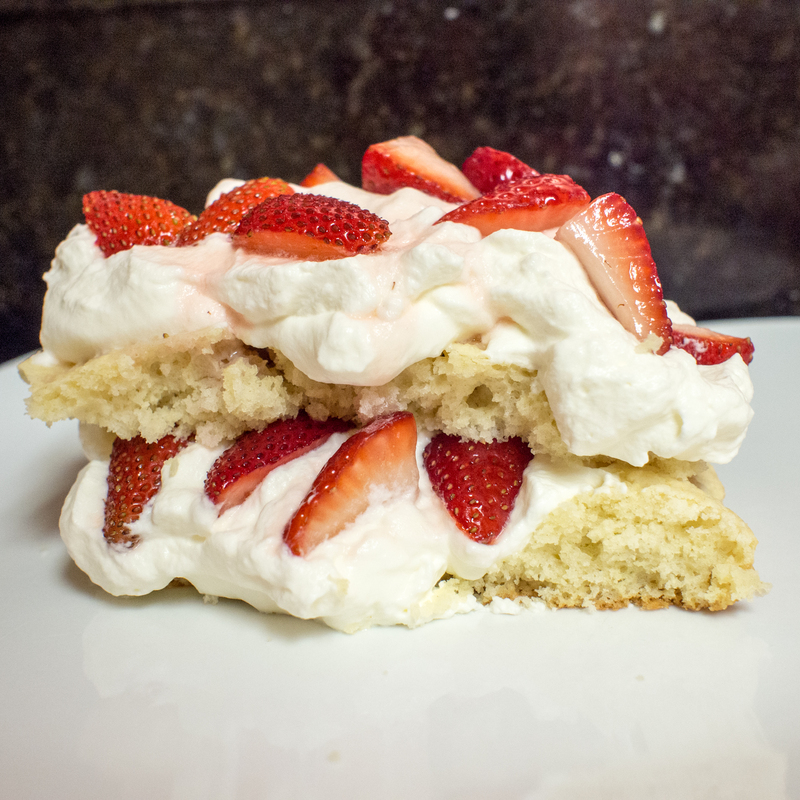 Fold in half of the whipped cream. 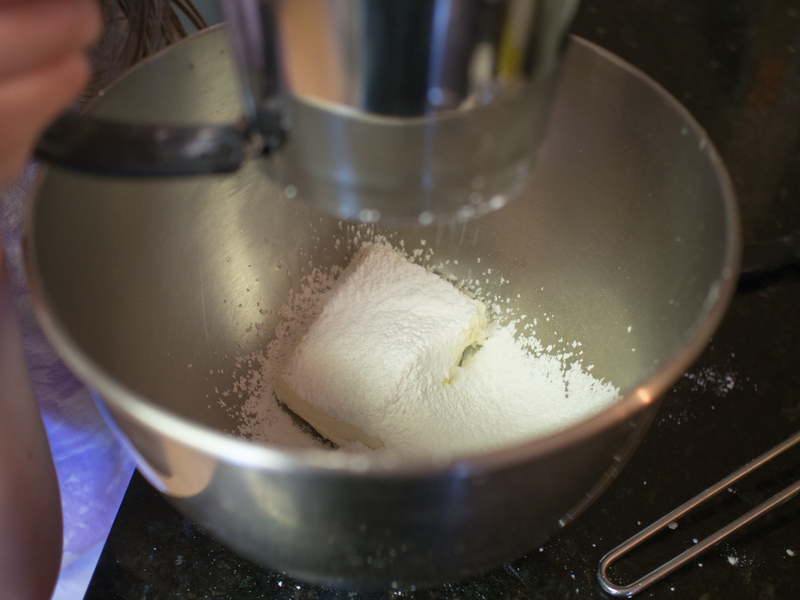 Whip the ingredients together with whip attachment on the mixer to thoroughly combine. Spread peanut butter mixture into pie shell. Refrigerate for at least an hour, until set. Top with remaining whipped cream and chocolate shavings. 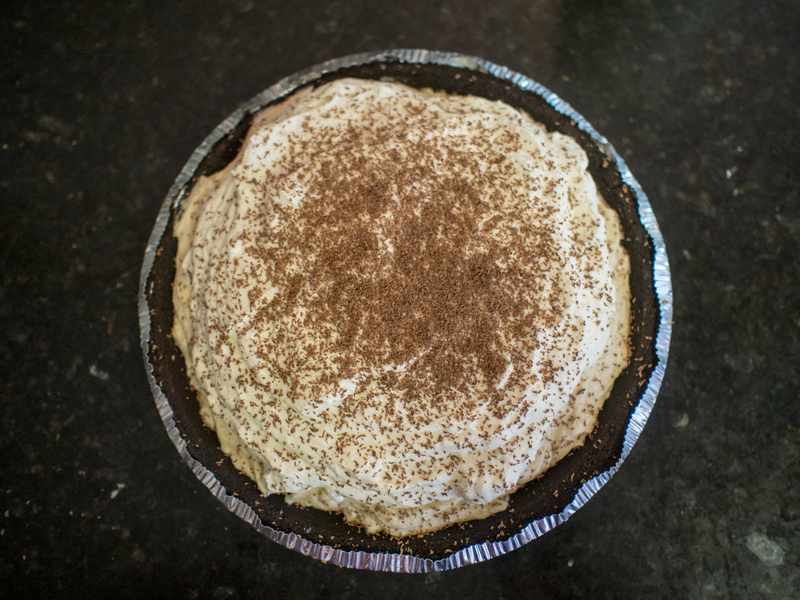 This entry was posted in Dessert and tagged cream, easy, no bake, peanut butter, pie on August 23, 2014 by dawn of food. As a kid I LOVED Campbell’s New England Clam Chowder. As I began cooking more for myself, there’s no comparison between canned soup and homemade. Gumbo is the biggest example of this disparity. Canned gumbo and actual gumbo are two entirely different species. 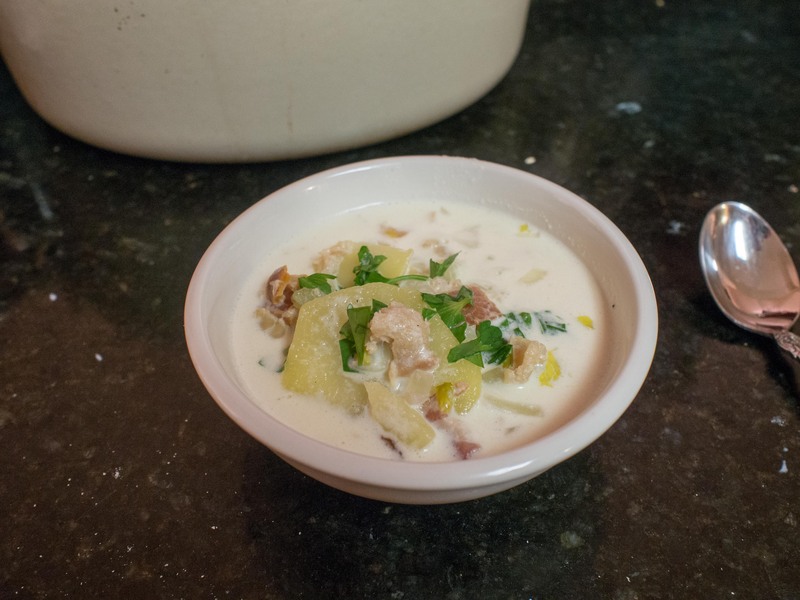 Would homemade New England Clam Chowder be that much better? I had to find out. This is the closest bridge I have found to that rather horrendous soup called Manhattan clam chowder. It is a sensible recipe and takes away the curse of the other, which resembles a vegetable soup that accidentally had some clams dumped in it. Pretty much sums up my feelings on the non-New England version. Cook clams, chop clams, reserve cooking liquid. Render fat from salt pork, sauté onions in salt pork fat. Parboil potatoes for 5 minutes. 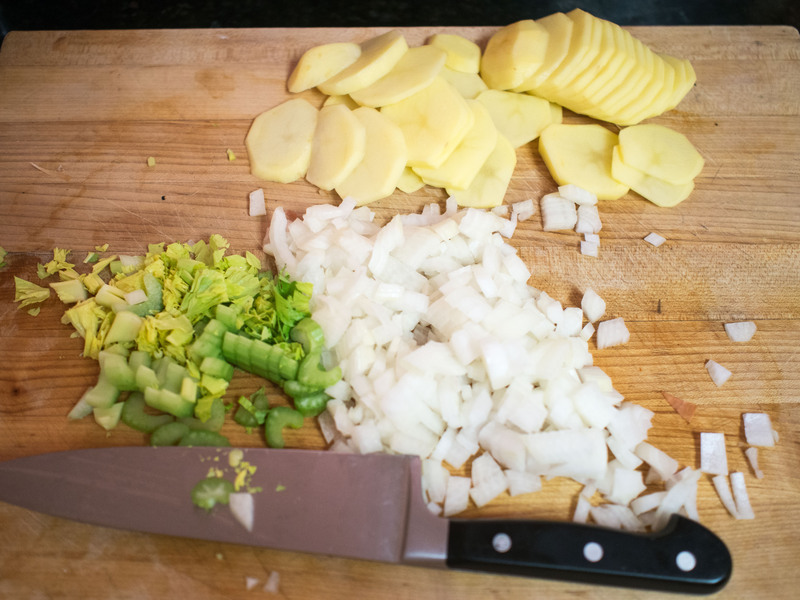 Arrange onions in the bottom of a heavy sauce pan and top with a layer of half of the potatoes. Add the salt pork pieces, chopped clams, second layer of potatoes and salt and peppers. Cover with boiling water and cook. Add scaled milk, bring to a boil, add crackers soaked in milk and the reserved clam liquid. 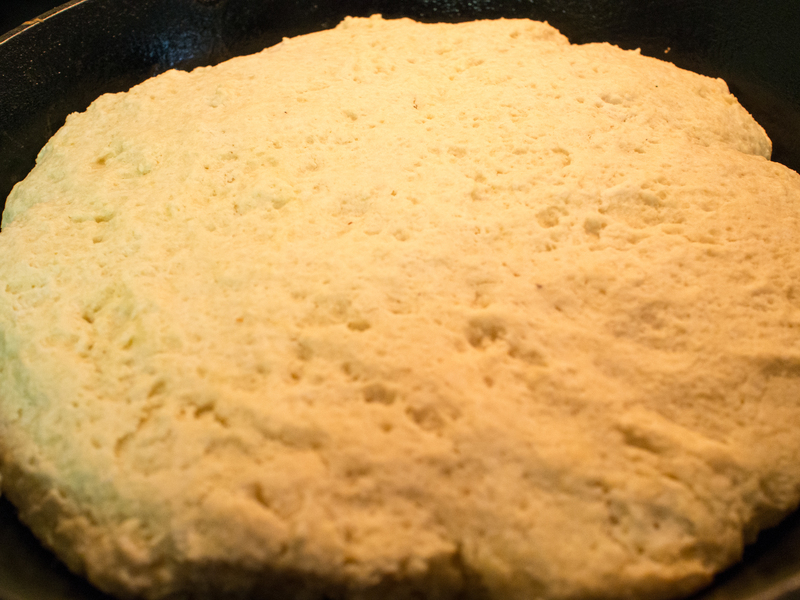 Lastly, add a bit of flour and butter that have been kneaded together, return to the boiling point and serve. You can find the above version in Fannie Farmer and other famous New England cookbooks. I agree with James Beard that it appears this recipe allows the clams to cook for too long. Plus, I would worry the onions would burn. I’m sure they wouldn’t, but didn’t see the point of testing it out. So, I came across a little recipe in Beard’s American Cookery that seemed easy, yet captured the spirit of the New England Clam Chowder. As a plus, it is cracker (and gluten) free! As an extra bonus, this recipe is shockingly cheaply made. At Whole Foods, I grabbed a pound of frozen clam meat for $6.99. Heavy Cream was an additional $4.99 for a quart (I don’t use it all), add a couple of potatoes, an onion, few stalks of celery, and a few strips of bacon and you are good to go! 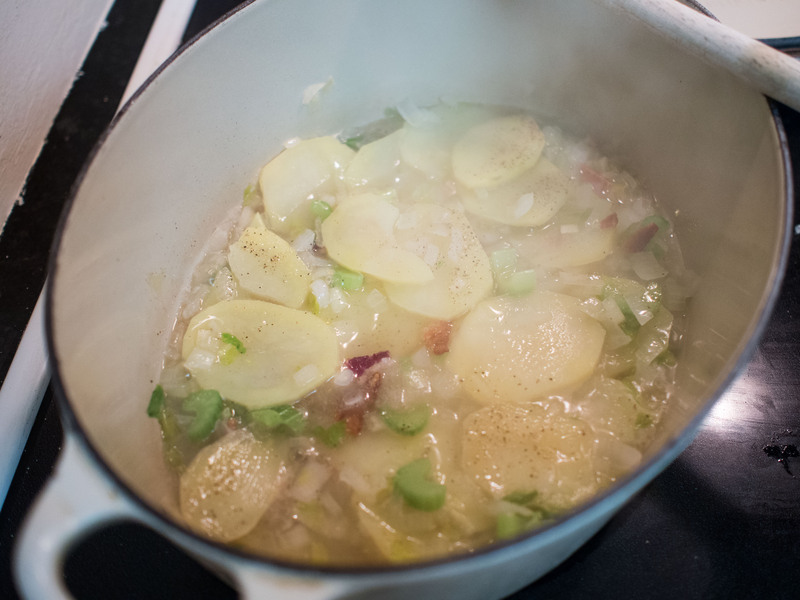 The recipe below was inspired by Beard’s “My favorite Clam Chowder” recipe from American Cookery. The family loved it and I’ll never eat canned chowder again. It was really, really good!! It also makes a great weeknight dinner! Cook the bacon in a sauté pan over medium heat, until fat is rendered and bacon is crisp. Remove bacon and add the onion and celery and sauté until translucent, or just slightly brown and remove from heat. In a 4 quart sauce pan, bring the salted water to a boil. Add the potatoes, cooking until just tender. Add the bacon, onion, celery, salt and pepper to taste, and the clams and heavy cream, simmering until the clams are no longer frozen. Bring to a boil and remove from the heat. Correct the seasoning. According to Mr. Beard, serve with a “dollop of butter, merest pinch of thyme, and a bit of chopped parsley”. This entry was posted in Gluten Free, Main Dishes, Seafood, Soup and tagged clam, Clam Chowder, cream, easy, Gluten Free, New England, Soup on January 19, 2014 by dawn of food. You’re invited to a cookout. You want to bring something, but what? You could pick something up at the local supermarket. I find those foods sort of sit because people want to try the homemade stuff first. But you are busy, right? No time for homemade. Or, maybe your cooking skills just aren’t up to where you would like them to be. You want to take something that will be the talk of the picnic. You want to be fawned over. I get it. Who doesn’t? No one wants to be potato salad #3 at a picnic with 5 different types of potato salad. 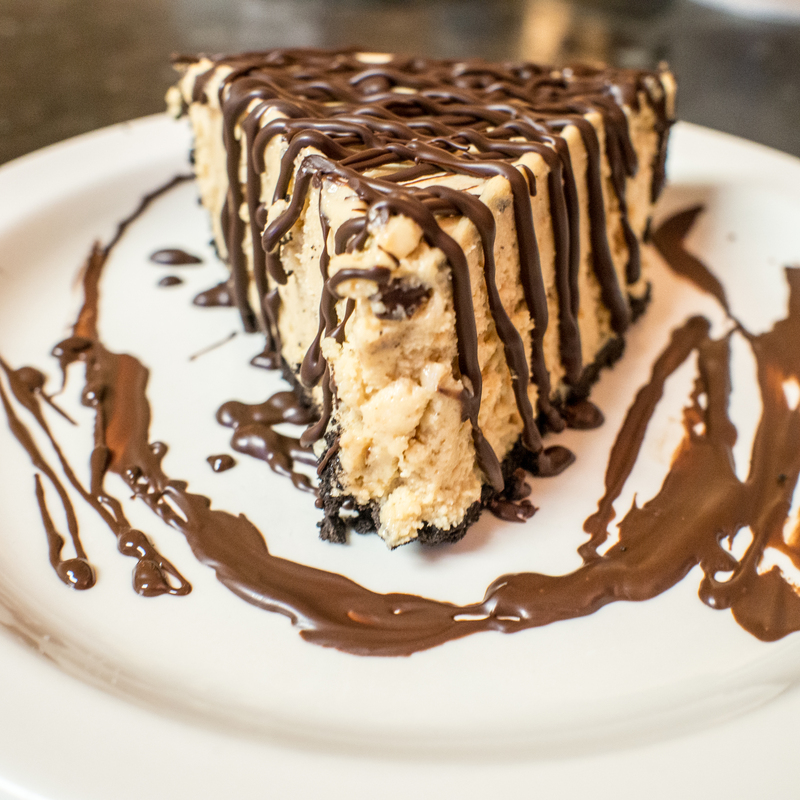 So, I offer the following dessert: Peanut Butter Cream Pie. Why? 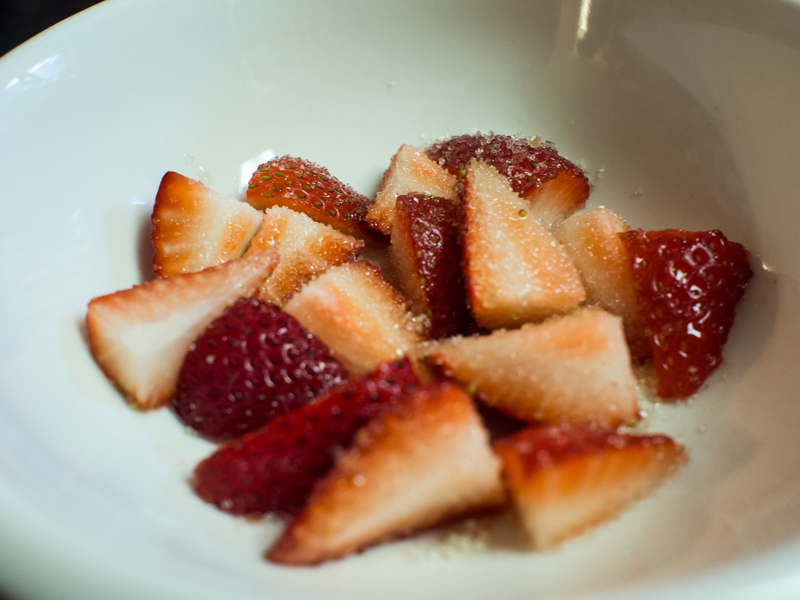 Because, frankly, fruit desserts just aren’t my thing, with the exception of apple pie. 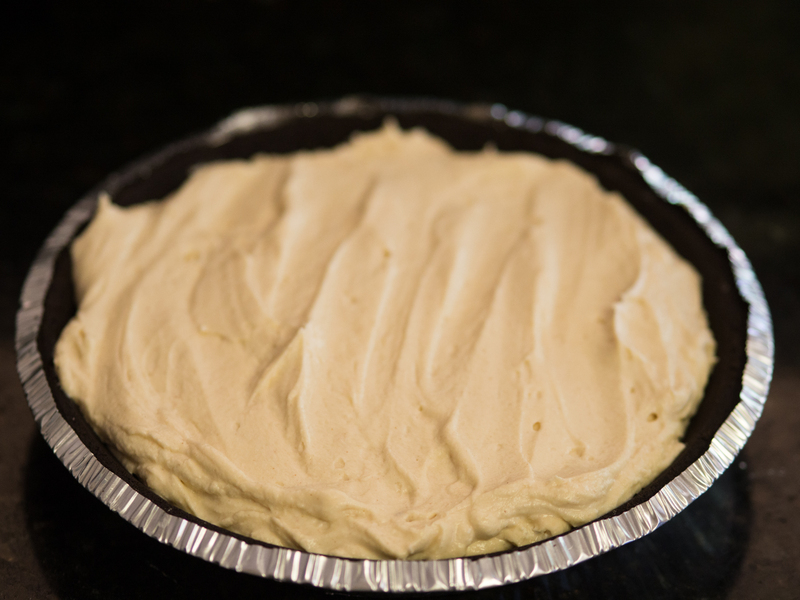 Peanut Butter Cream Pie combines some of my favorite ingredients: cream, sugar and peanut butter. What’s not to love? It’s not like Chocolate Cream Pie, so don’t be worried about whether the pie will “set” or if you will need to serve it in bowls. If you have a mixer and a freezer, you can totally make this dessert. It’s that easy. I found this dessert years ago in New Orleans at Emeril’s. He put the recipe for it in his cookbooks and now, on his webpage. The pie is crazy easy. 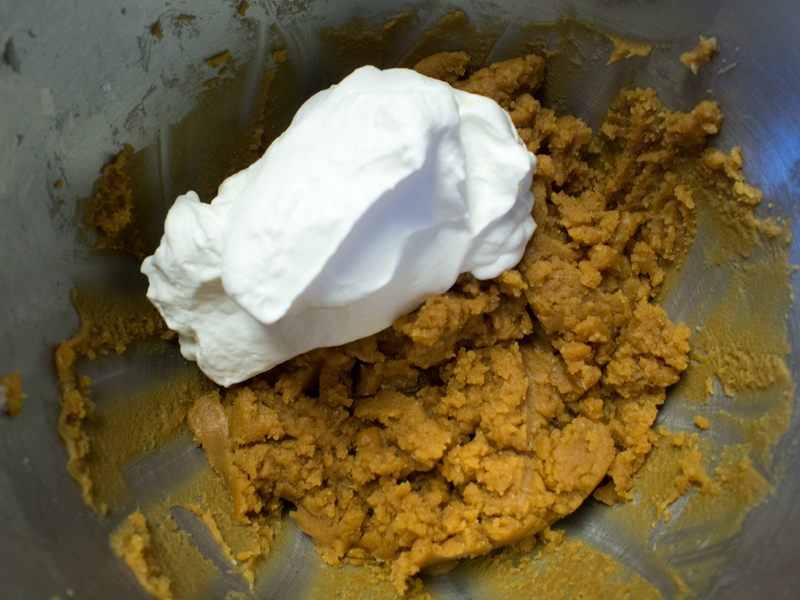 Combine peanut butter, cream cheese, confectioner’s (powdered or 10x) sugar and whipped cream. Pour into crumb crust. Freeze. Done. Seriously. If you want to be fancy, melt some chocolate and stripe the top of the pie. Some caveats. This is a really rich pie, so cut the slices small. You will want to cut a hunk of pie off and eat it. Don’t. You can’t. My 10 year old son who grows 6 inches a year tried and couldn’t. Also, you need to not just like peanut butter, you need to love it. My deviations are the crust and the amount of peanut butter. I looked at a pre-made graham cracker crust, but that had trans fats. 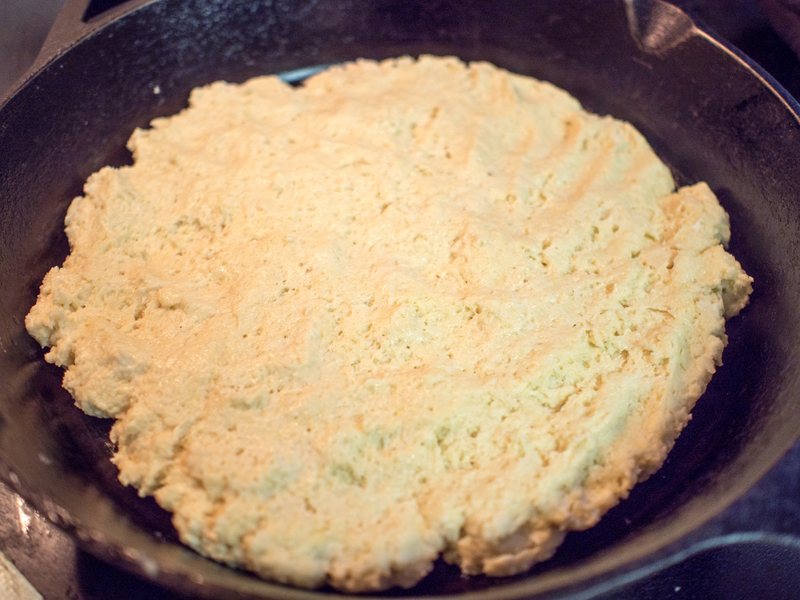 So, I was resigned to the fact that I was going to have to make a crust. I thought chocolate wafer crust would be the best, but the thought of taking the middles out of a ton of oreos made me weep. Luckily, on my travels to three different grocery stores (can’t 1 just have everything I need? ), I found an oreo cookie crust with no trans fat or other terribly nasty ingredients, so I went with it. As a result, that last minute find made this recipe super easy and fast. I reduced the peanut butter by 1/4 cup just to bring a little more balance to the pie. Cream together the cream cheese, sugar and salt, until well combined and “fluffy”. Add the peanut butter and vanilla and beat until combined. 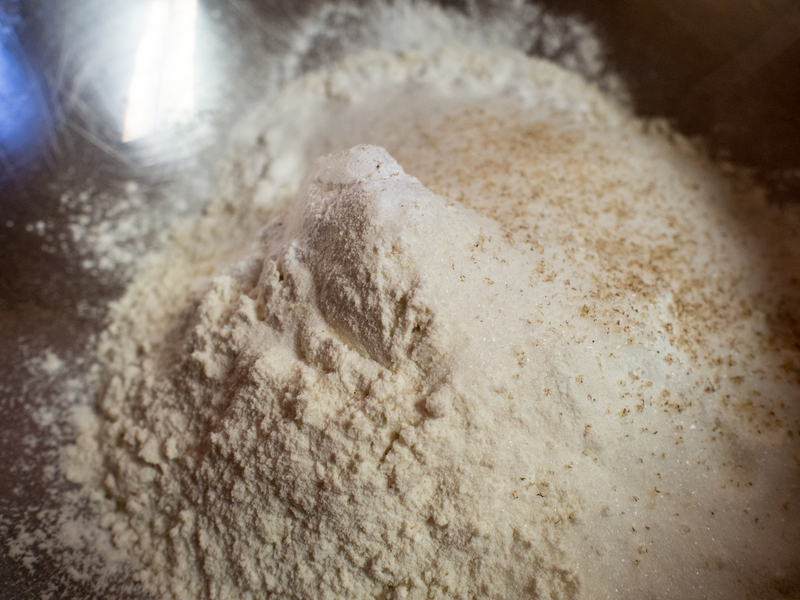 In a separate mixing bowl, whip the heavy cream until soft peaks form. 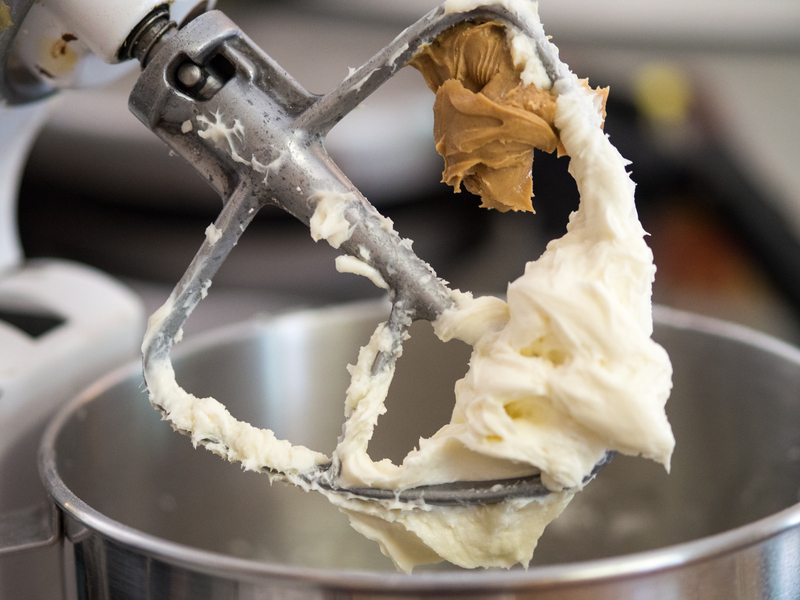 Loosen the peanut butter mixture by folding in about a third of the whipped cream. 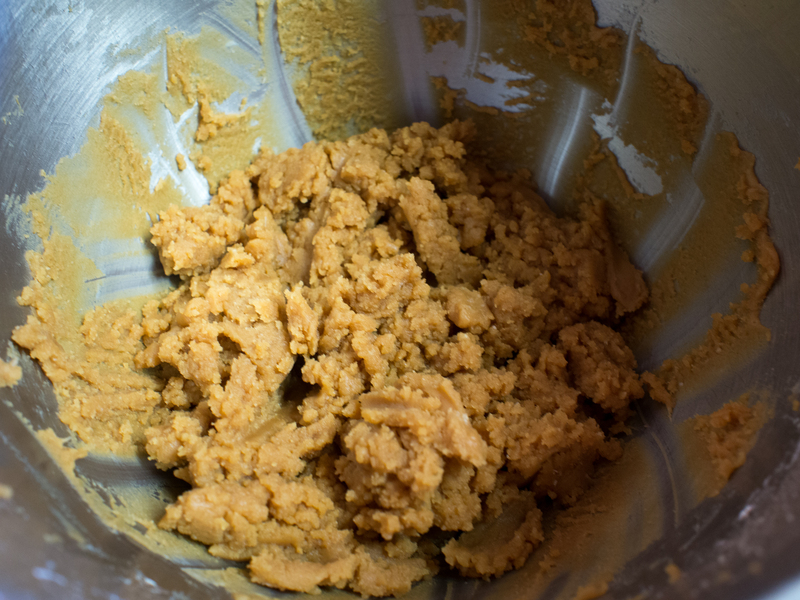 Add the rest of the cream to the peanut butter mixture and, using a mixer with a whip attachment, whip until well combined. 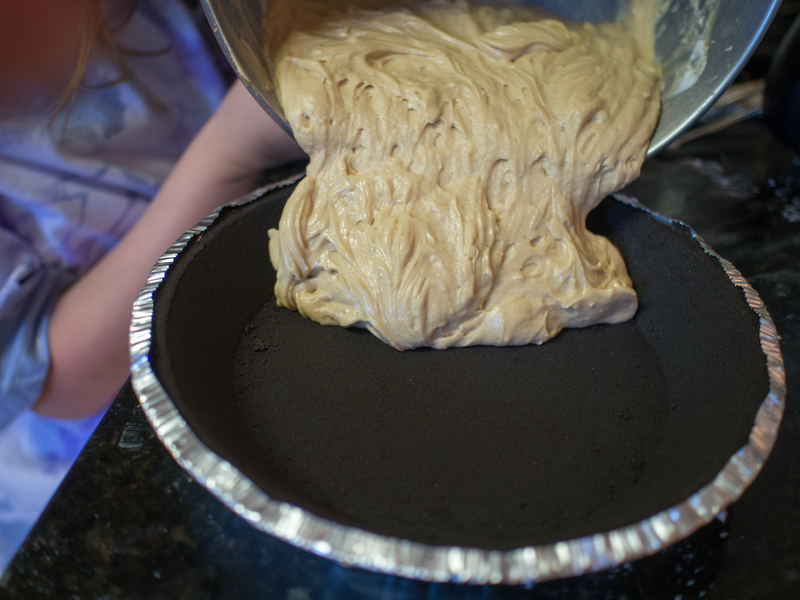 Pour peanut butter mixture into oreo pie crust and freeze for about 2 hours. Place melted chocolate in a freezer bag and snip a small opening on a corner of the bag. Drizzle chocolate on the pie and serve. 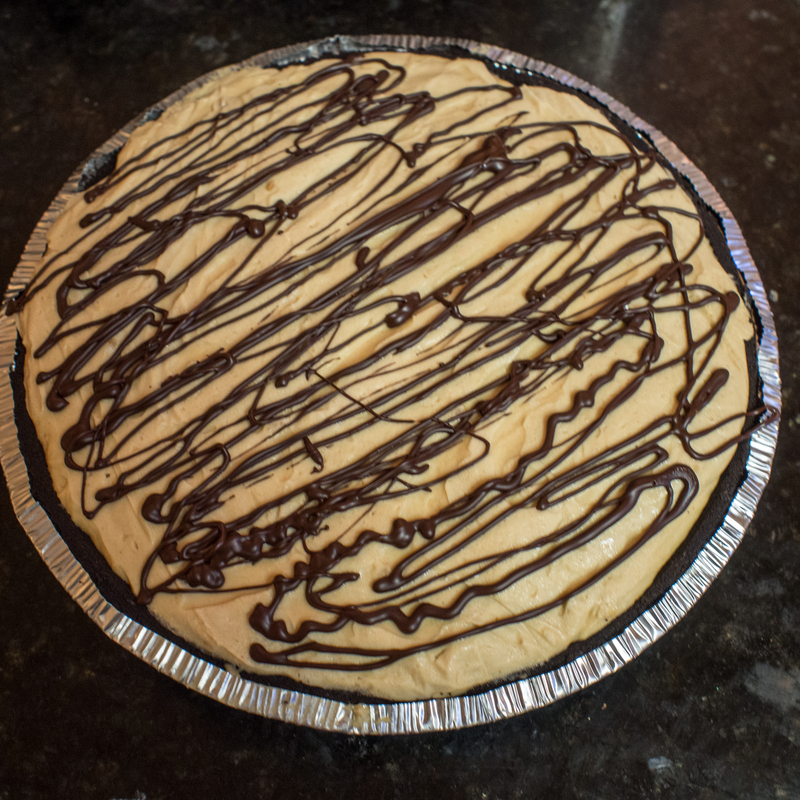 This entry was posted in Dessert and tagged chocolate peanut butter cream pie, cream, dessert, easy, Emeril Lagasse, Martha Stewart, no bake, Oreos, peanut butter, peanut butter cream pie on June 13, 2013 by dawn of food.